THE KOOTENAYS # 1 COMMUNITY FESTIVAL ! You’ll find exceptional artists, artisans, musical entertainers, heritage theatre performers, unique activities, multiple sports tournaments, friendly competitions & amazing demonstrations!! PLUS daily community breakfasts, BBQs & banquets with the most sensational selection of food ! Our community spirit is showcased from one end of the city to the other! See photos of previous events on the Sam Steele Days Facebook page. Every year it gets better ! It all takes place in Cranbrook, BC in the Kootenay Rockies. 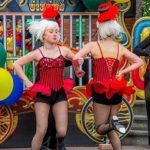 For information on accommodations, vendor & volunteer opportunities, central fairground booths or activities, contact the Sam Steele Society at info@samsteeledays.org or call 250-426-4161. If you are wanting to register please follow the 2018 registration link.